Great weather, fun activites all weekend in Oak Bay. Start with the Mad Hatter Fun run at 10:15 am. Parade at 10:30 down Oak Bay Avenue finishing off at Willows Beach located in the Estevan area of Oak Bay. Lots of entertainment starting at noon today featuring 'Groove Kitchen'. Enjoy kayak rides and Yoga. 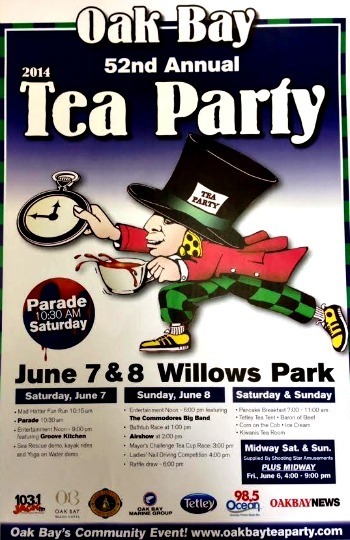 Midway open until 9:00pm, Pancake Breakfast, Tetley Tea Tent, Corn on the Cob, Ice Cream, and the Kiwanis Tea Room all weekend long during this 52nd Annual Tea Party event. Bring a blanket, towel and just enjoy! Let's do it!